Tales from the Den of Chaos: Monday ALREADY?! 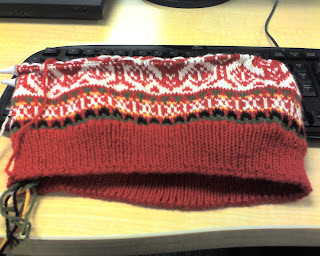 Well, must be Monday - there's some sweater progress. But still...that weekend surely did go by in a hurry, didn't it? A blur of sound and light. Mother's day presents, cleaning, shopping, gardening and suddenly here I am...back in the office like the weekend never even happened. And there's a light drizzle falling this morning. Because it was hot in my neighborhood yesterday, so I wore a short-sleeved shirt. Awesome!